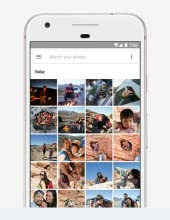 Never lose a memory with unlimited storage for your photos and videos, all stored at full resolution in Google Photos. Once you’ve captured the moment, Google Photos keeps all your photos backed up and organized, so you can find and share them faster than ever. It’s easier than ever to capture that perfect shot. Take crisp photos, even in low light. And catch action shots as they happen with Smartburst. Once you’ve captured the moment, Google Photos keeps all your photos backed up and managed, so that you can find and share them faster than ever. 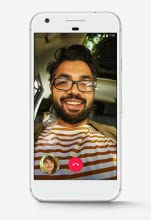 Google Duo is a simple video calling app for Android & iOS that brings you face-to-face with just a tap. And with the Knock Knock feature, you’ll see the caller before you pick up, so that you never miss a moment. Google Allo is a smart messaging app that helps you to say more and do more. Bring your personal Google Assistant right to your group chats to find restaurants nearby, share videos to watch and get answers. Express yourself better with stickers, Smart Reply*** and much more. When you need a quick charge, the reversible USB Type-C charger gets you up to 7 hours of battery life in just 15 minutes. And when you aren’t using your phone, Doze automatically puts it into a sleep state to extend your battery life, so that you can always move at your speed. * Data connection required. The Google Assistant is currently available in English on Pixel, and will be coming soon to other languages, including French, over the course of the next year. 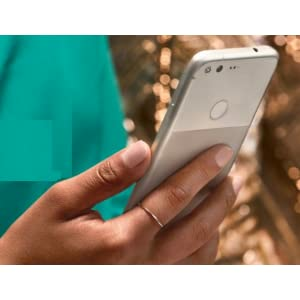 ** Unlimited backups for photos and videos taken with your Pixel phone. Requires Google account. Data rates may apply. *** Feature only available in English. **** Battery claims based on charging with the included charger and a mix of talk, data and standby use. An active display will use battery more quickly. Android, Google, and other marks are trademarks of Google Inc.